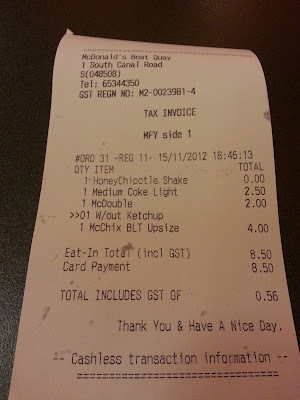 Yesterday around lunch, shortly after I finished writing the review for the Blueberry Pie, I had a notification on my Facebook news feed that McDonald's Singapore had uploaded a new video. This was said video. 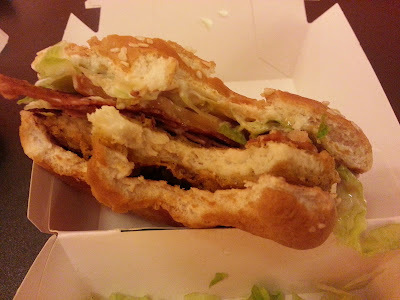 I was actually counting down the days until the Samurai Burger finally disappeared (after reviewing it twice, once in Malaysia, and once in Singapore, I was ready for something new). When I first watched the promo video, I thought "well, its a McChicken with Bacon and a Tomato...yay" because really that's all this burger is. 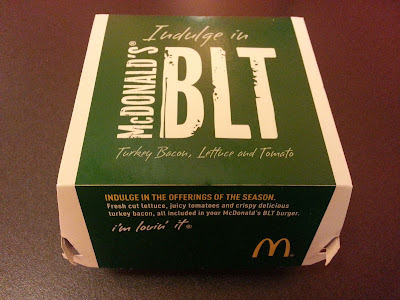 Though, after reading a little more product information and finding out that the bacon used, is Turkey, rather than pork, it made me somewhat a little more excited to go try it. I sent a message to my girlfriend asking if she wanted to try it with me for dinner, or if I should have it alone at lunch. She wanted me to wait, so that's exactly what I did. We met at Clarke Quay station, and we made short walk over to the Boat Quay branch. 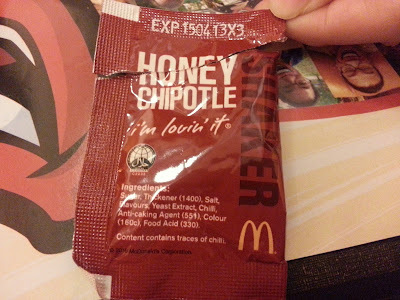 We decided to just share one upsides set (so we could get the Honey Chipotle Shakers), and a $2 McDouble, no need for getting 2 expensive sets when we can share one fry and drink. It was nice to see that they had promo packaging, as that's always a nice touch in my book. 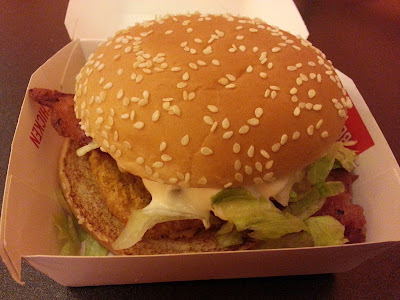 I opened up the burger, to see if it was worth the near $2 premium over the regular McChicken. I was expecting one slice of Bacon, as I recently received on the Big Tsukimi Burger, but to my surprise there were 4 slices! Ok...one was a little small nub, but the other three were entire strips! I've had a lot of McDonald's and I don't think I've ever had a burger with 3.5 strips of bacon before. Naturally, my GF had the first bite, and she said, 5/5! 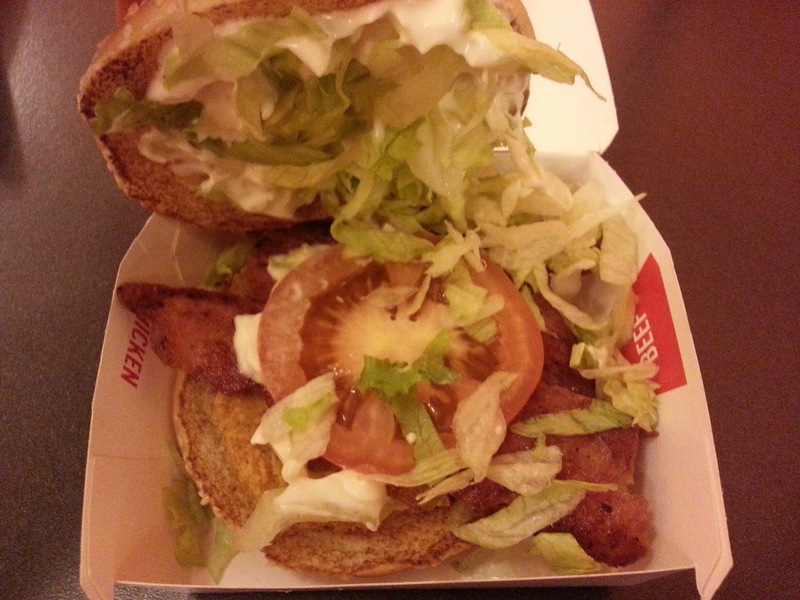 Sure, I was a little hesitant, as she has done that before, but when I tried it, it was hot, the bacon was crispy and flavourful, and there was just the right amount of mayo and veggies. I personally don't think it was a 5/5, but I did like that bacon! Less fatty, and a nice, almost smokey flavour which was nice with the crispy chicken. I think with a premium bun, and a non-mayo sauce, it would have easily been a 5. Korea never had Shakers in the 3 years I was there, but she absolutely HATED the last time I brought one back from Hong Kong for her to try, as she claimed they were too salty and full of MSG. Though the Singapore packaging had the ingredient list, and it said there wasn't any MSG, she only used half the provided sachet. (But I'm sure that lack of MSG in the list actually let her enjoy it this time). I personally liked the shakers a lot. 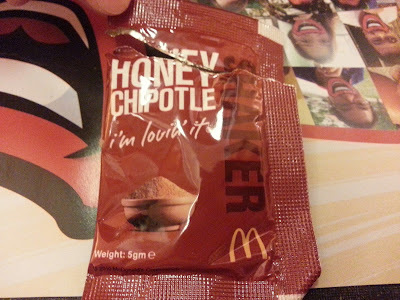 Unlike the recent Cheese McShakers which was pretty terrible, this tasted exactly like Chipotle should, but I couldn't taste the honey at all. My girlfriend never even read the packaging, but half way through she asked "Did they put honey in this? "...so I guess some people can taste it. I even sprinkled a little onto the burger itself, which made it even better. 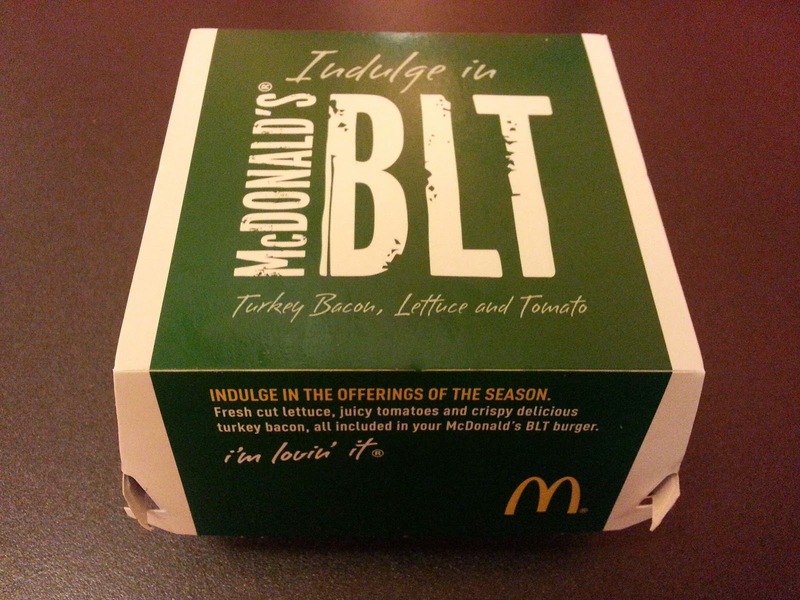 They are coming up with a new BLT.. Quarter Pounder with Cheese BLT. Looking forward to try it? Hope the future promos are a little more inventive than that, but I'll still give it a try. in mcdonald germany, there is a new thing you should try. It's some kinda thing with sausages and mustard in a bun. 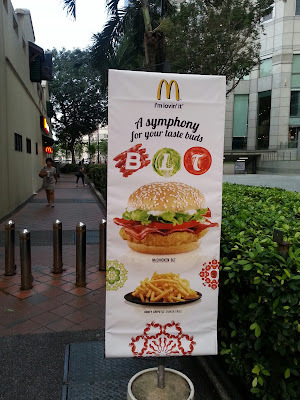 Turkey bacon is an absolute disgrace and should be banished from Macca's in Singapore. 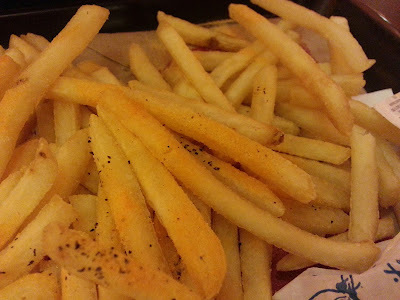 It make me so sad to have to eat that nasty stuff. Give me ma bacon!! !